A witness has told a Lusaka magistrate’s court that the diploma which was awarded to Local Government and Housing Deputy Minister Steven Masumba was irregularly issued because the minister did not successfully complete his training programme. National Institute of Public Administration (NIPA) examination officer Lydia Nyondo Chibale said Masumba did not successfully complete his Accounting Technician Diploma course and as such, he did not deserve to be awarded a certificate. She was testifying before Principal Resident Magistrate Wilfred Muma. Masumba is alleged to have obtained pecuniary advantage by false pretences. Ms Chibale of Kabwata Estates said NIPA records showed that the deputy minister had arrears and was absent in one of the subjects in the 2003 examinations. 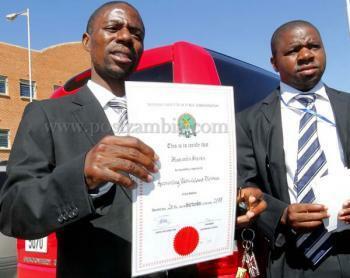 But Masumba graduated from NIPA and was awarded a genuine diploma certificate bearing a NIPA logo, seal and signature. Ms Chibale said Masumba did not deserve the certificate because he failed the basic accounting subject in the first level as he obtained 28 per cent when the pass mark was 50 per cent. She said Masumba again failed the subject when he re-wrote it the following year as he obtained 38 per cent. The records further showed that Masumba was absent in level three examination in auditing and taxation and was advised to re-write the subject. Ms Chibale said in August 2008, two officers from the Anti-Corruption Commission (ACC) visited the institution to request for details on Masumba’s qualifications after which she printed and gave them a copy. She said it was discovered that Masumba did not complete his course as he still had an arrear and was absent in one of the subjects. She said when it was discovered that a diploma was irregularly issued to Masumba, attempts were made to invite him to NIPA to discuss the issue but to date the deputy minister had not shown up. She said the reason for summoning him was for him to avail the institution with a photocopy of his statement of results and also to inform him that his certificate had been nullified. She, however, told the court that to date, Masumba’s certificate had not been nullified and it was still valid. During cross-examination, defence lawyer, Mutakela Lisimba asked how possible it was for Masumba to have graduated and awarded a genuine certificate when he did not successfully complete the course. Ms Chibale said the institution expected Masumba to uphold integrity and own up that he did not deserve the certificate because he knew his examination results status. Mr Lishimba wondered how NIPA could place the blame on his client when it was the same institution which invited Masumba for graduation and awarded him the certificate.